Our patented Phytoscreen© immunochemical endophyte test kits are easy to use and carry a shelf life of six months when stored as directed. They are manufactured when you order them and stamped with an expiration date to inform your laboratory technicians which kits need to be used first and when to reorder. Endophyte detection products come with a positive and negative control to compare your samples and score accordingly. 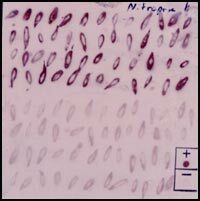 Our patented Pytoscreen© ELISA kits for ergot alkaloid kits can be used for qualitative analysis, but with addition of a standard can also be used for quantitative analyses. This immunoblot test kit tests 100 field tillers for endophyte presence. This immunoblot test kit is the same a ENDO797-3 only a smaller format for testing smaller stem cross sections. This immunoblot test kit tests 100 seeds for endophyte presence. This ELISA qualitative alkaloid detection kit can analyze 96 tillers for alkaloid presence. This quantitative ELISA kit can analyze 54 samples for ergot alkaloids in urine containing 0-100 ppb. Note: A creatinine analysis is important to interpret the data. See our Phytoscreen creatinine kit. This quantitative ELISA kit can analyze 54 samples for ergot alkaloids in plant tissues containing 0 to 4 ppm. Samples with higher alkaloid concentration can be diluted for analysis. This first and simple colorimetric kit utilizes the microplate format typical of ELISA to analyze up to 54 samples. It can be analyzed on any microplate reader capable of reading at a wavelength of 490-510 nm.